Alex Kingston was teamed up with her onscreen love interest, Valarie Pettiford, at the 2018 San Diego Comic Con to talk about the first season of A Discovery of Witches based on the bestselling book series by Deborah Harkness. Pettiford, a big fan of the supernatural who was thrilled to be a part of the show, and Kingston talked about their characters (Sarah Bishop and Emily Mather), the source material, and how they approached the show’s magical elements during our roundtable interview at Comic Con. 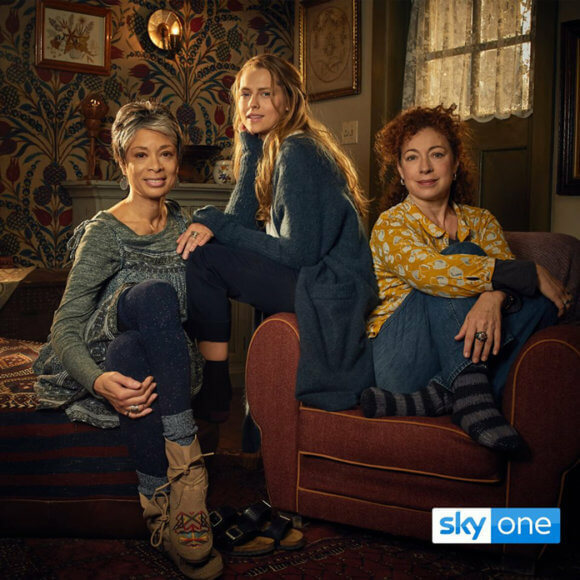 A Discovery of Witches premieres on Sky One on Friday, September 14, 2018. Did you do any research into witchcraft before taking on the roles? Alex Kingston: “I didn’t prepare in that way because I didn’t know…I didn’t want to bring something to the table in the sense that it was then not going to be right. I wasn’t sure how they envisioned Sarah and Em and what their world was going to be like. We had time because we are sort of slowly drip-fed into the show, we basically had time to sort of evolve during the show. I mean, for the first oh my gosh it seemed forever, all we ever were doing was sitting on the porch at the end of a phone. And in doing that and sitting on the porch, you sort of look around. You see how the porch has been designed, what sort of props and little bits and pieces the designers, along with Deborah, have created. And that kind of slowly also informed the sort of life that Sarah and Em were living, and also informed the kind of nature of their personalities a bit. So, yeah, that was it. And in the interior because Sarah has her own special room where she makes her potions, her soaps, her creams that she’ll sell at the market – farmers markets and things – that felt very much like this is Sarah’s domain. But that was kind of it. With the novels having such a passionate fanbase, how are you feeling about delivering on the anticipation for the series? Can you talk about the relationship between your characters and how they fit into Diana’s life? Alex Kingston: “I think also again it’s sort of like anyone who’s gone through a tragedy – Diana’s parents were murdered and Sarah and Em know the reasons for their murder. They might even have suspicions as to who may have murdered them, but they don’t know for sure. But, certainly, there is darkness around the deaths of her parents and so to raise this child and to keep that child protected and to fear for that child’s safety as this girl gets older and wants to step out into the world, the answer for particularly Sarah is to be naturally over-protective, and without really being able to explain fully to Diana why. And even Diana going to Oxford and wanting to take the path of being a professor and writing a thesis, she’s far away from them. I think that doesn’t sit comfortably. What do you think Em loves the most about Sarah, and Sarah loves the most about Em? It’s nice to embrace the flaws of the characters too, isn’t it?